Odds are someone reading this article received a gift card this holiday season. But, what if the card is for a store, restaurant or vendor rarely frequented or nothing appeals to the cardholder? There is always regifting, opting to “purchase” something unlikely to be used, or letting the card languish in a drawer. Now, however, more people are taking advantage of websites that enable them to offload unwanted gift cards. Just be aware of the pros and cons involved when selling or exchanging (and buying resold) gift cards. The popularity of gift card giving continues unabated, with cards now available for purchased 24×7 in countless stores and online. It is a $127 billion market and an estimated $1 billion in cards go unused annually. The biggest growth areas are digital or e-gift cards that can be sent electronically in minutes, and the burgeoning options for exchanging or reselling gift cards. 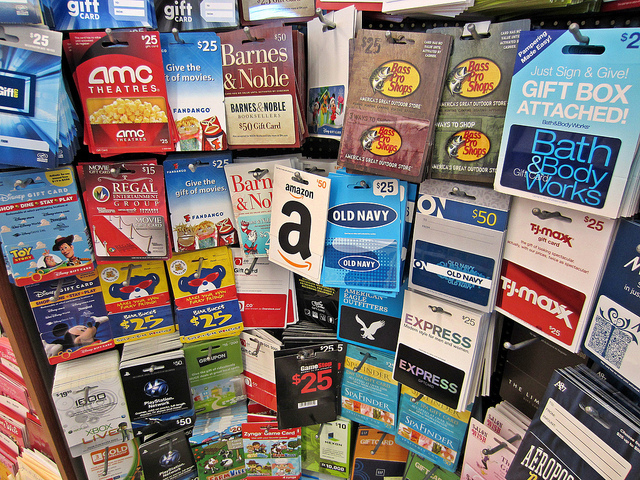 Reselling a gift card has grown more common due to the rising number of sites catering to the market: Cardpool.com, Cardcash.com, Raise.com, and GiftCardGranny.com and three big ones. They offer more security to buyers and sellers than turning to Craig’s List or eBay. Some sites allow users to exchange gift cards for ones from other retailers or chains for more of a return than if they opted for cash. People who sell their gift cards receive far less money than the gift card’s face value. The rates are largely based on supply and demand, and it behooves sellers to shop around for the best deal. The sites allow people to purchase resold gift cards at a discount. (This is a great way to buy gift cards for presents or oneself.) Types offered vary based on what they recently acquired. However, if someone plans to buy something for $100 at a store and can pick up a card worth that much for $90, they saved 10 percent right off the top! The best selling gift cards on CardCash.com include Walmart, Target, Home Depot, iTunes, Macys, eBay, Starbucks, and AMC Theatres. Surprisingly, the cards resold the most in 2016, according to GiftCardGranny.com, include major retailers where anyone could readily find something to purchase. The list contains Amazon, Target, BestBuy, and Macy’s. ITunes and Starbucks are on the list too, but not everyone likes digital entertainment or coffee. The sellers either needed the cash or chose a card they needed more. Reputable gift card exchanges or resellers offer guarantees that the cards are legitimate. A huge con is receiving less than the face value of the card being sold. Some sites pay 80 to 90 cents on the dollar for popular cards, but other cards only resell at 50 percent of the face value. That may discourage some sellers, but getting something is better than putting the card in a drawer and forgetting about it. For card purchasers, some cards are only offered for sale (or exchange) at 1 or 2 percent off the face value. Not every gift card can be sold or exchanged. It depends on the popularity of the vendor at which it can be redeemed. For example, a large national chain is generally accepted, but a smaller one or a regional one may not be. Many people made New Year’s resolutions to improve their finances, shop smarter, or avoid clutter. In spite of the pros and cons, taking advantage of sites that exchange, sell or buy gift cards can be steps in the right direction. 2 Responses to "Exchange or Sell Gift Cards Pros, Cons"
We even faced same when we started our own handicraft selling site. Thank you for highlighting valuable info we faced at the beginning.